Weird legal system: proof of ownership is not enough; victims need to prove their property was stolen. Judge Henry Edward Autrey gone crazy – from now on thieves and fences can say: give proof this was stolen. Provenance information about the Ka Nefer Nefer mask was manufactured by the infamous Aboutaam brothers. The lady shall remain in St. Louis, says U.S. District Judge Henry Edward Autrey. The judge ruled March 31 in favor of the Mask of Ka-Nefer-Nefer, the named defendant in a dispute between the U.S. government and the Saint Louis Art Museum over the provenance of an ancient Egyptian mask. The government claimed that the mask was found to be missing from Egypt in 1973, and that the Egyptian Supreme Council of Antiquities became aware it was at the Saint Louis Art Museum in 2006. “In its verified complaint, the Government boldly states that it seeks the forfeiture of all rights, title and interest in a 3,200 year old Egyptian Mask because ‘the circumstances’ indicate it was stolen property at the time it was imported into the United States,” the judge’s opinion states. But, Autrey found, the government didn’t substantially prove that the treasure was actually stolen, smuggled or clandestinely imported; just that it had gone missing. It was excavated in Saqqara, Egypt in 1952. For a while, it stayed boxed up. Then it went to Cairo in 1959, to prepare for an exhibit in Tokyo. But the Japanese trip never happened, and it returned to Saqqara in 1962. In 1966, it went back to Cairo, and wasn’t found in its assigned box during a 1973 inventory. “The Government cannot simply rest on its laurels and believe that it can initiate a civil forfeiture proceeding on the basis of one bold assertion that because something went missing from one party in 1973 and turned up with another party in 1998, it was therefore stolen and/or imported or exported illegally,” the opinion reads. The museum referred calls to their attorney in the case, David A. Linenbroker of Husch Blackwell, who was not immediately available for comment.The mask itself, on display in gallery 130 of the museum, presumably had no comment. via St. Louis Art Museum wins fight to keep ancient Egyptian mask Missouri Lawyers Media. ST. LOUIS • The St. Louis Art Museum filed a federal lawsuit Tuesday asking a judge to order that the U.S. government has no claim on a 3,200-year-old mummy mask that officials in Egypt say was stolen from their country two decades ago. The Ka-Nefer-Nefer mask, with its inlaid glass eyes and shimmering plaster face, has been on display here since the museum purchased it in 1998 from a New York art dealer for $499,000. It has been a source of controversy since at least 2006, when a top Egyptian antiquities official demanded its return, saying it had been stolen in the early 1990s from a storage room near the step pyramid of Saqarra, where it was unearthed in 1952. According to the lawsuit filed in U.S. District Court in St. Louis, the government is now trying to seize the mask for return to Egypt. The suit asks for a judge to order the government to stop, contending that there is no proof the mask was stolen and that the statute of limitations has expired for any seizure under the Tariff Act of 1930. According to that act, the seizure of any smuggled or stolen property must be within five years of the time of the theft, or two years after the theft was discovered, the suit says. The U.S. government is named as a defendant, along with U.S. Attorney Richard Callahan, Attorney General Eric Holder and Department of Homeland Security Secretary Janet Napolitano, whose agency oversees customs enforcement. David Linenbroker, the museum’s attorney, said authorities made it clear at a meeting hosted by the U.S. attorney’s office Jan. 13 that the museum must hand over the mask or face seizure. Linenbroker said several assistant U.S. attorneys were there, as well as homeland security officials. He said federal prosecutors from New York also phoned in, presumably because that is where the mask first entered the country. Callahan would not confirm whether his office has begun forfeiture proceedings in court, or plans to do so. He also did not confirm the Jan. 13 meeting. “It promises to be an interesting lawsuit, but I think any further response would best be left to a legal pleading,” Callahan wrote in an e-mail response to questions. Ka-Nefer-Nefer was an ancient noblewoman at the court of Ramses II. Her mummified body was discovered in 1952 by Egyptian archaeologist Mohammed Zakaria Goneim, and the mask was among the antiquities uncovered. The museum has insisted over the years that it researched the artifact’s ownership history before acquiring it from Phoenix Ancient Art, in New York. The museum reached out to Interpol and the Art Loss Register, among other entities, it contends, and was given no indication of questions about how the mask arrived in the U.S. The museum’s research showed the mask was part of the Kaloterna private collection during the 1960s when it was purchased in Switzerland by a Croatian collector, Zuzi Jelinek. Jelinek sold the mask to the New York art dealer in 1995, according to the museum, which noted that gaps in ownership history are not unusual for rare, ancient objects. The lawsuit says many of the allegations surrounding the mask began with Tom Cremers, the operator of the Museum Security Network, in Amsterdam, who sent multiple e-mails to government officials in 2005 and 2006 calling for an investigation. Cremers could not be reached Tuesday for comment. ST. LOUIS — A St. Louis museum can keep hold of a 3,200-year-old mummy’s mask, a federal judge has ruled, saying the U.S. government failed to prove that the Egyptian relic was ever stolen.Prosecutors said the funeral mask of Lady Ka-Nefer-Nefer went missing from the Egyptian Museum in Cairo about 40 years ago and that it should be returned to its country of origin. The St. Louis Art Museum said it researched the provenance of the mask and legitimately purchased it in 1998 from a New York art dealer. U.S. District Judge Henry Autry in St. Louis sided with the museum.The U.S. government “does not provide a factual statement of theft, smuggling or clandestine importation,” Autry wrote in the March 31 ruling.“The Government cannot simply rest on its laurels and believe that it can initiate a civil forfeiture proceeding on the basis of one bold assertion that because something went missing from one party in 1973 and turned up with another party in 1998, it was therefore stolen and/or imported or exported illegally,” the judge wrote.A message left with Egypt’s Supreme Council of Antiquities was not returned.The 20-inch-long funeral mask of painted and gilded plaster-coated linen over wood with inlaid glass eyes was excavated from one of the Saqqara pyramids, about 16 miles south of Cairo, in 1952. 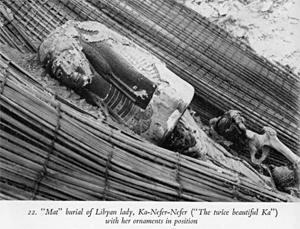 Ka-Nefer-Nefer was a noblewoman who lived from 1295 BC to 1186 BC.U.S. government investigators suspect the mask was stolen sometime between 1966, when it was shipped to Cairo for an exhibit, and 1973, when the Egyptian Museum discovered it was missing.The art museum bought the mask in 1998 for $499,000 from a New York art dealer, and it has been on display at the museum in Forest Park ever since.U.S. Attorney Richard Callahan said a decision on whether to appeal has not been made.“We’re just looking to make sure we haven’t missed the tiniest bit of circumstantial evidence,” Callahan said. “We’re back to the drawing board and studying it.”Museum officials have said they researched the mask’s ownership history before buying it and had no indication there were questions about how it arrived in the U.S. The museum’s research showed the mask was part of the Kaloterna private collection during the 1960s, before a Croatian collector, Zuzi Jelinek, bought it in Switzerland and later sold it to Phoenix Ancient Art of New York in 1995. The art museum purchased the mask from Phoenix Ancient Art.St. Louis Art Museum attorney David Linenbroker said the museum is confident the ruling will mean that the mask can remain permanently in St. Louis.“We don’t have any interest in possessing a stolen object,” Linenbroker said. “We’ve been facing all this innuendo for years.”He said the legal process provided an opportunity for someone to prove the mask had been stolen, but no one did.“We’re confident we’re the rightful owner,” Linenbroker said. St Louis Art Museum “Looking After” Ka Nefer Nefer? The collection history of the mask of Ka-Nefer-Nefer currently in the St Louis Art Museum is crucial to the SLAM claim to the object. The mask was excavated by Muhammed Zakaria Goneim in 1952 in a grave at Saqqara. It was part of a small Ramesside cemetery in the layers overlying the lower courses of the unfinished step pyramid of Sekhemkhet. We do no know what position Ka Nefer Nefer (or Neferu) held, though circumstantial evidence suggests she lived in the times of Rameses II in the 19th Dynasty. Her body had not been mummified, the corpse was given a gilded cartonage mask and placed (apparently unwrapped) in a grave wrapped in a large reed mat. This is a type of rite more commonly associated with lower class burials, though the quality of the mask and accompanying gold items and range of amulets (and two alabaster shabtis) most of them inscribed with her name show that this was not the burial of a poor woman. It has been suggested that she was of Libyan ancestry.I’d like to draw attention to the wiki by K.M. Johnston on this burial which is more accessible to most readers I would guess than Gonheim’s own published account, it was put up on 16 January 2011 and deserves much more attention, this is because it highlights what else was in that grave. The smaller items are all still in Saqqara.Let us imagine that the version fed to SLAM by the dealers, the Aboutaams, is true. The idea is that for his merits as an archaeologist the Egyptian Government in its munificence gave him one of the objects from the state-funded excavations he had directed as a reward. This is the way the mummy mask (the Aboutaams suggest) came onto the market legally, as the excavator’s own private property.This is highly unlikely to have happened. First of all this is not what happened in Egyptian archaeology in the 1950s. Furthermore, Gonheim himself was not exactly flavour of the month after he had embarrassed the government in June 1954 when a much hyped pyramid-opening was a flop when the sarcophagus turned out to be empty. 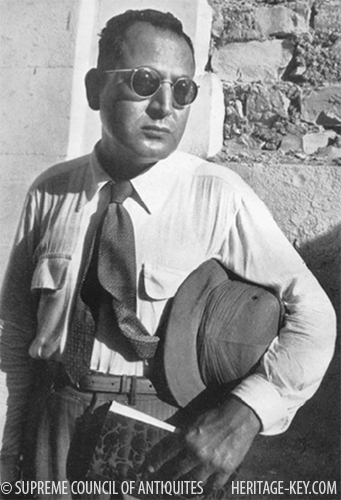 He was soon after this hounded, accused of antiquity thefts (it seems unjustly – there is a history of that in Egyptian archaeology) and committed suicide (or was killed) in January 1959. At what stage would the mask be “given to him” in the Aboutaam version of events? It was found early in 1952, seven years later Gonheim was dead. When he published the book in 1956 he thanked the Supreme Council for use of the photo of the object, unlikely if he had then been in possession of it.After he died, under the shadow of accusations of pinching stuff, under what circumstances would his heirs be able to export it and a foreign gallery purchase it? Also, had Goneim’s enemies been accusing him of stealing objects, if he had indeed officially been granted the possession of one of his excavated finds, the fact that a whopping big mummy mask was not in the collections would have aroused suspicions, and one would have expected there to be a trace in some written records somewhere that he had secured himself against accusations on that account by providing some details of how he had come by this rather noticeable object by official channels. Instead, he was accused of nicking a vase (which later turned up in the muddle – even in 1959 – of the stores at the Egyptian Museum).More to the point, the grave contained a whole lot of goodies. Had a magnanimous official wished to “reward” an archaeologist for doing his job, why would he choose the biggest – and most museum-displayable – thing in the grave? There were two gold inlaid pectorals, and two alabaster shabtis, if ‘partage’ of some sort was being practiced, surely one of those would be a good ‘gift’? The amulets or beads likewise. The Saqqara storeroom is already full of such things. Anything would have made a more suitable “present” (official or not) than the mask.The fact is that in 1952-9 no ‘partage’ had been practised for thirty years. The Aboutaam/SLAM story fails to provide any evidence why in this particular case that principle was ignored, and why it was the mummy mask that Goneim “received”. Of course neither party feels under any obligation to support their far-fetched interpretation of events.Of course if the mask originated from Gonheim, as the Aboutaams assert, and it had not been an official grant, that too has consequences for the SLAM claim to ownership.Photo: Mohammed Zacharia Goneim (1905-1959): the first owner of the Ka Nefer Nefer mask? The St. Louis Museum of Art (SLAM) filed a complaint in federal district court on February 15, 2011 asking for a declaratory judgment to prevent federal authorities from seizing a 19th Dynasty Egyptian mask popularly known as Ka-Nefer-Nefer. The St. Louis Art Museum was informed by me soon after the purchase of that Mask that it came from Goneim’s excavations, was published and where, and that although it was not registered in the Cairo Museums’ inventory, the only means by which it could have legally left Egypt was if it had been retained by Goniem and later legally sold by him or his heirs and they would need to investigate this. They did not. Another telling fact is that the name of the owner of the mask Ka-nefer-nefer was written in hieratic on the hand of mask and was scratched out and over painted to disguise its identity. If this were a painting published in a European catalog no one would dream of trying to justify keeping it without a clear and legitimate history. The Museum never undertook due diligence in trying to determine the provenance of this piece despite being told there was a cloud over it from the beginning. They have no justification in retaining this mask and it should be returned to Egypt and the Museum should underwrite the cost of a conservator removing the over paint and restoring the inscription on the hand. The curious case of St Louis Art Museum vs the United States may have just become “curiouser and curiouser” with the U.S. District Court’s dismissal of the government’s effort to forfeit the disputed Ka Nefer Nefer mask, but what about the case of St. Louis Art Museum vs public opinion? The American Association of Museum (AAM) Code of Ethics for Museums says that a museum must make a “unique contribution to the public by collecting, preserving, and interpreting the things of this world.” How is the public served in the case of Ka-Nefer-Nefer? What do you think? Add your voice to our latest poll: Should the St. Louis Art Museum return the disputed Ka-Nefer-Nefer funeral mask to Egypt? via St. Louis Art Museum | Saving Antiquities for Everyone. For the time being, and perhaps permanently, the funeral mask of Ka-Nefer-Nefer remains the property of the St. Louis Art Museum. It’s not entirely clear whether this is a good thing or not. On Friday, U.S. Attorney Richard G. Callahan asked U.S. District Court Judge Henry E. Autrey to reconsider his March 31 order dismissing the government’s claim that the 3,200-year-old “mummy mask” somehow had been improperly obtained by the Art Museum in 1998. The government of Egypt, which lost track of the mask in 1973, wants it back. The judge’s decision was a victory for the Art Museum, which has steadfastly insisted that it made exacting efforts to determine the mask’s provenance before purchasing it for $499,000 from Phoenix Ancient Art, a New York antiquities dealer. Say you spend $200 for a 52-inch Sony plasma TV that a guy tells you fell off a truck. Two weeks later, the cops show up at your door asking for a receipt. In Missouri, you can be charged with a Class C felony for receiving stolen property even if you claim you didn’t know the TV was stolen. The art and antiquities world is far more complicated. It is a world full of passionate advocates and venal flim-flammers. Tracing the origin, ownership and authenticity of any given object can be hideously difficult. There are cultural and political ramifications, even philosophical differences. Does art belong, by right, to the country of origin, even if that country is in chaos? Or does art transcend geography and belong to humanity? Are people being deprived of their cultural heritage, or should art be appreciated by and preserved for the widest possible audience? For all of these reasons, the mask of Ka-Nefer-Nefer has become a minor cause célèbre in the art and antiquities world. After it was discovered in 1952, it was stuffed away in storage for more than 20 years. It appears to have become important only when the St. Louis Art Museum began exhibiting it. Zahi Hawass, a flamboyant self-promoter who was Egypt’s minister of antiquities under President Hosni Mubarak, began demanding its return. Last week the Egyptian newspaper Al-Arham reported that Egypt’s new government has charged Mr. Hawass with wasting public money and stealing Egyptian antiquities. As Egypt prepares for elections next month, issues of cultural heritage have been put on the back burner. Eventually, as the United States builds relations with the new Egypt, U.S. museums may face greater pressure to return Egyptian art. But under international patrimony laws that existed in 1973, when Egypt discovered that the mask of Ka-Nefer-Nefer was missing, the Art Museum here seems to have a solid claim of ownership. David Linenbroker, the attorney for the St Louis Art Museum (SLAM), has spoken about the legal ruling over the Egytian mummy mask acquired by the museum (“Judge: 3,200-year-old mummy mask can stay in Mo.”, AP, April 5, 2012). We don’t have any interest in possessing a stolen object …We’ve been facing all this innuendo for years. I am delighted that SLAM does not want to “possess” stolen objects. Museum officials have said they researched the mask’s ownership history before buying it and had no indication there were questions about how it arrived in the U.S. The museum’s research showed the mask was part of the Kaloterna private collection during the 1960s, before a Croatian collector, Zuzi Jelinek, bought it in Switzerland and later sold it to Phoenix Ancient Art of New York in 1995. The art museum purchased the mask from Phoenix Ancient Art. It is now clear that the mask could not have entered the “Kaloterna collection” in the early 1960s as the object was still in Egypt. The collecting history for the mask appears to be seriously flawed. Why? What could be the motive?What does Linenbroker understand by “innuendo”? Perhaps he could produce the authenticated documentation demonstrating the full collecting history of the mask. Perhaps he could explain the apparent fact that the mask was still in Egypt at the time that the museum claimed it was in a private collection in Switzerland. St. Louis Art Museum attorney David Linenbroker said the museum does not “have any interest in possessing a stolen object” and “We’re confident we’re the rightful owner“. He adds: “We’ve been facing all this innuendo for years”.Well, it has gone a little beyond “innuendo”. According to documents the seller supplied to the St. Louis museum, the mask was seen in 1952 at an antiquities dealer in Brussels, Belgium. Roughly ten years later, the provenance says, the object was bought by a private collector and then sold to an unnamed Swiss citizen, in whose private collection it would remain for 40 years. In 1997 the mask was purchased for an undisclosed sum by Phoenix Ancient Art, which sold it one year later to the Saint Louis Art Museum for $499,000. The provenance bases the mask’s Belgium stopover on the eyewitness declaration of a Swiss man named Charly Mathez, who in 1997 attested that he’d seen the Ka-Nefer-Nefer at a Brussels gallery 45 years earlier. After buying the mask, Saint Louis Art Museum officials contacted Mathez in the hope that he might provide additional information that would bolster the provenance. “It’s been a long time,” Mathez replied in a letter dated October 5, 1999, conceding that he could not recall the name of the Brussels gallery and apologizing that he could be of no further assistance. This is odd, there is no trace anywhere else of there ever having been a “Kaloterna” collection, either in Croatia (then in Communist Yugoslavia behind the iron Curtain) or outside. How did this Kaloterna get the object from “Brussels” through the Iron Curtain? How did the object get back through the same barrier in “the early 1960s” at the height of the Cold War? 1952 object given to the excavator who immediately sends it out of Egypt and sells it (how?) and it ends up in a Brussels gallery. 1953 onwards, the mask is bought in Brussels by a mysterious “Kaloterma”- possibly Croatian. 1952 the object was still in Egypt. In 1953 onwards it cannot have been in an otherwise unknown “Kaloterma” collection, since it was still in Egypt. Soon after its purchase by the otherwise unknown “Kaloterma” it cannot have been sold to the otherwise unknown “Swiss collector” in the early 1960s, since it was still in Egypt. To be precise it was in the Egyptian Museum in Cairo. It remained there until 1962, when the mask was still in Egypt and was transferred back to Saqqara. The verified complaint further states that the Mask cannot have been in a Swiss collection in 1966 since in that year it was taken from Saqqara and went back to the Cairo Egyptian Museum in “box number fifty-four”. This is the “last documented location of the Mask in Egypt”. The boxes were placed in storage and it was only when they were opened in 1973 for inventorying that it was discovered that in the seven-year period (1966-73) the object had been taken from its box and now could no longer be found in the Museum. There is no record of any legal purchase of this object, or any legal transport of this object out of Egypt between 1966/73 and 1997. In 1997 the mask was purchased for an undisclosed sum by Phoenix Ancient Art. 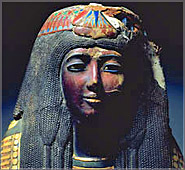 After a six-year controversy over the ownership of the 19th-Dynasty mummy mask of Ka-Nefer-Nefer, a noblewoman from the court of Pharaoh Ramses II, a United States federal judge has ruled that it should stay at the St Louis Art Museum where it has been exhibited since 1998. The US government had claimed the mask was being held illicitly and should be returned to Egypt. According to the stltoday website, US District Judge Henry Autry vindicated his ruling that the US government failed to prove that the ancient Egyptian mask had been stolen and smuggled abroad after it went missing from the Egyptian Museum in Cairo about 40 years ago. The US government “does not provide a factual statement of theft, smuggling or clandestine importation”, Autry recorded in the 31 March ruling. “The government cannot simply rest on its laurels and believe that it can initiate a civil forfeiture proceeding on the basis of one bold assertion that because something went missing from one party in 1973 and turned up with another party in 1998, it was therefore stolen and/or imported or exported illegally,” the judge wrote. US Attorney Richard Callahan told stltoday that a decision had not been made on whether to appeal. The ruling came after almost a year-long lawsuit between St Louis Art Museum (SLAM) and the US government, which wants to seize the mask in order to return it to Egypt on the grounds that it is Egyptian property and has been stolen and illegally smuggled out of the country. SLAM attorney David Linenbroker said the SLAM did not have any interest in possessing a stolen object. He maintained that the legal process provided an opportunity for anyone to prove that the mask had been stolen, but no one did. Linenbroker said the SLAM was now confident now that it was the rightful owner. The suit opened in February 2011 when the SLAM filed a federal lawsuit asking the judge to order that the US government had no claim on the mask since there was no proof that it had been stolen and illegally smuggled out of Egypt, and that the statute of limitations for any seizure under the Tariff Act of 1930 had expired. According to that act, the seizure of any smuggled or stolen property must be within five years of the time of the theft or two years after the theft was discovered. In return, the US attorney’s office filed a series of court motions from mid-March in an attempt to seize the mask. Its official intent was that the government wanted custody of the mask through a civil forfeiture complaint, and it also sought a restraining order to prevent the SLAM from doing anything with the ancient artefact while the issue played out in court. The Ka-Nefer-Nefer mask is a very beautiful ancient Egyptian artefact depicting the face of a woman of the court of Ramses II. It has inlaid glass eyes and a smiling face covered in gold. The head is adorned with a startling black wig decorated with a gilded lotus flower, and each hand holds a wooden amulet signifying strength and position. A delicate scene carved in relief on the arms shows her successful ascent into the afterlife on the boat of the Great God Osiris. The Ka-Nefer-Nefer mask has been a source of controversy between the Ministry of State for Antiquities (MSA) and the SLAM since 2006, when the secretary-general of the then Supreme Council of Antiquities Zahi Hawass claimed it had been stolen and illegally smuggled out of the country and demanded its return to Egypt. “We are asking for the SLAM’s cooperation, and if this is not immediately forthcoming we will contact Interpol and start legal proceedings,” Hawass said. According to records held by the antiquities department, the funerary mask of Ka-Nefer- Nefer was discovered in 1952 by Egyptologist Zakaria Goneim while he was excavating the area of the unfinished Step Pyramid of the Third-Dynasty ruler Sekhemkhet on the Saqqara necropolis. Along with many other finds from the excavation, the mask was placed in the so-called Sekhemkhet magazine situated to the south of the pyramid of Unas. This and all the contents of the magazine were the property of what was then called the Egyptian Antiquities Authority. Goneim published the discovery in his 1957 book The Buried Pyramid, which also contained illustrations showing him and the mask in situ. According to the Saqqara inspectorate records, which are well documented, the Ka- Nefer-Nefer mask and other objects discovered during Goneim’s excavations were taken to the Egyptian Museum in Tahrir Square for a special exhibition. A trawl through the museum’s documents, however, has produced no evidence that the splendid mask ever entered the Egyptian Museum. Moreover, it was found that several of the other objects discovered by Goneim that had been sent immediately to the museum were stored unregistered until 1972. Goneim himself died in 1959, and from that year there was no mention of the mask in official records until in 2006 when Ton Cremers, the Dutch moderator of the online Museum Security Mailing List, raised a question about the provenance of the funerary mask in St Louis by sending an open letter to the SLAM’s director, Brent Benjamin, requesting information as to how the mask had made its way into the museum’s collection. He attached a letter from Maarten J Raven, a curator at the Rijksmuseum Van Oudheden in Leiden and joint field director of the Dutch excavations in Saqqara, verifying what was written in the Egyptian documents. In his e-mail, which was published on the Internet, Raven said that the Saqqara storehouse or magazine, which also served as a repository for numerous finds from the Anglo- Dutch excavations organised by the Egypt Exploration Society in London and the National Museum of Antiquities in Leiden, had been entered by force and plundered in 1985. “It is unknown to me whether the Egyptian authorities communicated this theft at the time. I myself have seen an object from the mentioned storeroom circulating on the Dutch art market in the early 1990s. I would not be surprised if various institutions and private collectors have purchased objects from this storeroom during this period,” Raven wrote in his e- mail. He continued that after the theft the storehouse had been partly dismantled by the local authorities and all its contents relocated to another storehouse at the edge of the Saqqara valley. The question raised by Cremers attracted the attention of several archaeologists and people concerned with this and similar issues. Among them was Michel Van Rijin, a self-appointed art-world watchdog, who in turn published Cremers’s piece of information on his website and contacted the SLAM. He also sent e-mails to the Egyptian authorities and to international journalists and newspapers, including the Weekly. Rijin’s website alleged that the SLAM had purchased a stolen artefact from the Phoenix Art Gallery run by the Aboutaam brothers, one of whom, Ali Aboutaam, has already been convicted in absentia by the Egyptian courts for art theft and sentenced to 15 years imprisonment as part of the El-Seweissi trial two years ago. “The half-a-million-dollar cartonnage mask was stolen from the Saqqara storehouse to order and was subsequently sold by the Aboutaams in 1998 to the SLAM, where it remains to this day, a hostage against the prevailing laws on cultural patrimony,” Rijin said on his web page. To support his claim, Rijin published Raven’s e-mail. Brent Benjamin dismisses the accusation, and told Hawass in a letter of response, of which the Weekly has obtained a copy, that the SLAM had great respect for Hawass and the SCA and was prepared further to investigate the claim that the mummy mask was stolen. He also pointed out that before buying such a revered object, the museum had carried out extensive research on its provenance and had confirmed that it was not plundered from Egypt. According to the SLAM’s documents and research over its ownership before it arrived in the possession of the museum, the mask was part of the Kaloterna private collection during the 1960s before a Croatian collector, Zusi Jelinek bought it in Switzerland and later sold it to Phoenix Ancient Art of New York in 1995. They in turn sold it to the SLAM in 1998. Now that a US court has ruled in the SLAM’s favour, this is where the case rests. The two variant versions of the collecting history most clearly clash in the period when the SLAM-promoted version has it in the possession of Zuzi Jelinek in Geneva. While the documentation supplied to the museum at the time of purchase by the dealer trying to sell it presents it as being in the Jelinek collection (see the earlier post on this and the house in which it was said to have been held), other documentation has it somewhere else.When the alarm about the mask’s whereabouts was initially raised, by Michel Van Rijn (whose previous flamboyant stay in St Louis is discussed here) and Ton Cremers they publicised an email by Marten Raven who drew attention to thefts from the storerooms at Saqqara, and more specifically the Sekhemkhet magazine to the south of the pyramid of Unas there. This is the one where the mummy mask would have been held if it was still in Egypt. The storeroom contained finds from the Anglo-Dutch excavations (organised by the Egypt Exploration Society in London and the National Museum of Antiquities in Leiden), was looted after the 1985 season. Dr Raven, witnessed the damage to the warehouse first-hand. After this theft, the storage facility was dismantled and the remaining contents relocated. This was the basis for the initial demands that St Louis Museum presented more information supporting its claim of rightful ownership (open letter to St Louis Art Museum director Brent Benjamin requesting information about how the mask had made its way into the museum collection). This is discussed in the February 2006 article: Kaufman, Jason E. 2006a. “This mask belongs to Egypt”, Art Newspaper no 167, March, 4 (reply: Kaufman, Jason E. 2006b. “’This mask is ours’ says St Louis Art Museum”, Art Newspaper no 170, June, 5). It was stolen from the Sekhemkhet Magazine at Saqqara in 1987, along with a number of other pieces. This theft was not discovered until an inventory of the magazine in 1995. Ghoneim registered his discovery in the official ledger at the government warehouse, or magazine, at Saqqara. The page in the ledger book, a key document Egypt has presented to St. Louis to stake its claim, shows a high-quality photograph of the mask, the finder’s name and ID number, and a detailed description. [Most other accounts of the existence of this ledger date from the end of November 2008]. I understand there is no mention in that register that the object was officially deaccessioned.Obviously SLAM must hold the position that the Saqqara ledger page they were shown is a later fake. They have offered no proof however that would stand in a court of law that this is the case. H[awass] produced documentation to show that it had been registered as the property of the Egyptian government by 1953, and that in 1959 it had been transported from storage in Saqqara to Cairo for display in the Egyptian Museum. Unfortunately, there is no documentation to show that the mask ever arrived in Cairo, and the assumption is that it must have been stolen sometime after 1959. Nevertheless, this would have been seven years after the mask is alleged to have been on the European antiquities market. In 1959, Ka-nefer-nefer’s funerary mask, along with a number of other objects from Goneim’s excavations, was transported from the Saqqara storerooms to the Cairo Museum en route to Tokyo for inclusion in an exhibition that was never mounted. It was returned [to] Saqqara, and then sent to the antiquities department conservation lab attached to the Egyptian Museum in 1966. In 1973, many of the objects from the burial of Ka-nefer-nefer were registered at the Egyptian Museum, Cairo. The mask was not among these objects; since it was the most important object in the assemblage, we can infer that it was missing by that time. St Louis Art Museum bought a mummy mask from Phoenix Ancient Art (Invoice to the Saint Louis Art Museum dated March 12, 1998 in SLAM document files). They had been supplied by the seller with a collecting history which seemed acceptable to them at the time, placing it in two central European collections in the early 1960s. Further information was supplied a few months after the purchase (the 4th October 1999 correspondence between Sidney Goldstein and Peter Lacovara) which seemed to be evidence that it had been on the European market even earlier, in 1952. The object entered the collection at the end of March 1998 (Accession Number: 19:1998).I have not seen it explicitly stated whose name is on that invoice. This would be worth checking. Phoenix Ancient Art is a family business. It was started in 1968 in Beirut by the Lebanese dealer Sleiman Aboutaam, a wealthy Lebanese businessman who reportedly had amassed a fortune through an exclusive contract to supply general merchandise to oil tankers in the Kuwaiti port of Al Ahmadi (Ron Stodghill, ‘Do You Know Where That Art Has Been?‘, New York Times March 18, 2007). Phoenix Ancient Art (incorporated since 1995) continues today under the leadership of his sons, Hicham Aboutaam and Ali Aboutaam. The younger son (born 1968) having finished studying art history at the University of Michigan began working in father’s business before 1998. The galleries changed hands when Sleiman Aboutaam and his wife were sadly among the 229 people who died on board Swissair flight 111 (from JFK New York to Geneva) which crashed six months after the Ka Nefer Nefer mask sale on 2nd September 1998 in the Atlantic off Nova Scotia. Hicham then took over running the New York gallery and his older brother Ali began running the Geneva gallery. They obviously inherited all their father’s stock and documentation. […] [Which?] Aboutaam also states that the mask was in the United States from 1995 until 1997, possibly indicating that it was in the possession of the New York branch of Phoenix Ancient Art, S.A. during that time [letter, September 23, 1997, SLAM document files]. In a letter of July 2, 1997, addressed to Hicham Aboutaam, the Swiss collector stated that this acquisition took place in the early 1960s . […] The Swiss collector requested anonymity […] The Swiss collector’s letter of July 2, 1997 confirms the sale of the mask to Aboutaam [SLAM document files]. In a letter dated March 19, 1998 [so a week AFTER the stated date of issue of the invoice for the purchase! ], Hicham Aboutaam indicated that an anonymous Swiss collector acquired the mask from the Kaloterna (possibly Kaliterna) family. It is odd that this suggests that this information is not offered in the July 2nd letter confirming (nota bene) the provenance of the object. Why did this information (apparently) only appear in writing eight and a half months AFTER Zuzi Jelinek wrote that letter and after, it seems, the SLAM had already decided to buy the object? What purpose did providing that additional information serve in March 1998?While the Charly Mathez letter (intimating that the object was on the market in 1952) is dated “February 11, 1997”, but was only shown to the Museum well after the purchase. Setting out in chronological order how the information obtainable from the material in the public domain about the collecting history as reconstructed by the Aboutaams emerged is quite an interesting exercise – but one I leave up to the reader to attempt, and then draw their own conclusions.